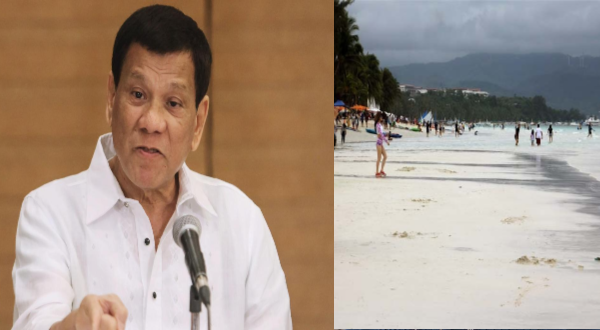 Home / News / Politics / It smells like crap says Duterte, Boracay Island, to be shut down. It smells like crap says Duterte, Boracay Island, to be shut down. The supposedly pristine white sand beach and one of the most famous tourist destinations, Boracay Island is turning into environmental disaster and by extension a serious health hazard, President Rodrigo Duterte mercilessly assessed. "I will close Boracay. Boracay is a cesspool," said the President. Tourism department officials stated that they acknowledge the situation due to the fact that the island’s sewage conditionings is worsening. "You go into the water, it's smelly. Smell of what? Sh**. Because it all comes out in Boracay," Duterte added. This remark by the President may be due to the fact that a number of establishments drain sewage directly into the sea, a revelation that Department of Tourism Spokesman Ricky Alegre explained. "There are certain areas there (where) . . . some establishments have illegally tapped their sewage line into the water line," Alegre continued. And out of the 150 local business establishments, only 25 were discovered to be connected to the sewage line after an inspection by the local government. Environment Secretary Roy Cimatu was ordered by the President to clean the island up. "I'll give you six months. Clean the goddamn thing," Duterte told Cimatu. Tourism Secretary Wanda Teo is losing hope in it, stating that, "It's a shame that Boracay, which has repeatedly been recognized by prestigious travel magazines as the world's most beautiful island, may yet end up a paradise lost if water contamination continues."